Hanoi is absolutely charming! I spent most of the day today walking / taking motorcycles around the city and it is amazing. At first I was thinking the extreme street chaos seemed a bit like the Asian scenes from the movie Blade Runner but it’s much more than that. The people are delightful and there is order to the busy chaotic streets. The streets are divided into “types” of businesses – jewelry in one area, galleries in another, fruits and vegetables another, silk and fabrics, boutiques and clothing in another, and so on. Although I constantly referred to a map I had trouble finding the streets I was looking for and so tried to plot my way by familiar landmarks – like the men selling colorful caged birds and smoking what absolutely had to be pot! The street scenes were terrific and priceless. I finally pointed out where I wanted to go to a motorcycle driver and mostly closed my eyes while we got there as I was sure we were going to have a dozen accidents that thankfully didn’t happen. 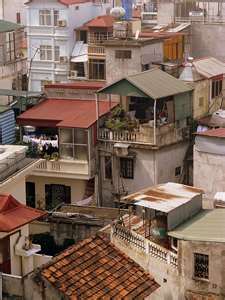 There are 10 urban districts and three of the main ones include Hoan Kiem, Dong Da, and Ba Dinh. 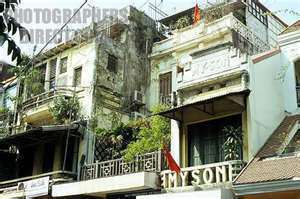 Named after Hoan Kiem Lake the Hoan Kiem District is the downtown and commercial center of Hanoi. 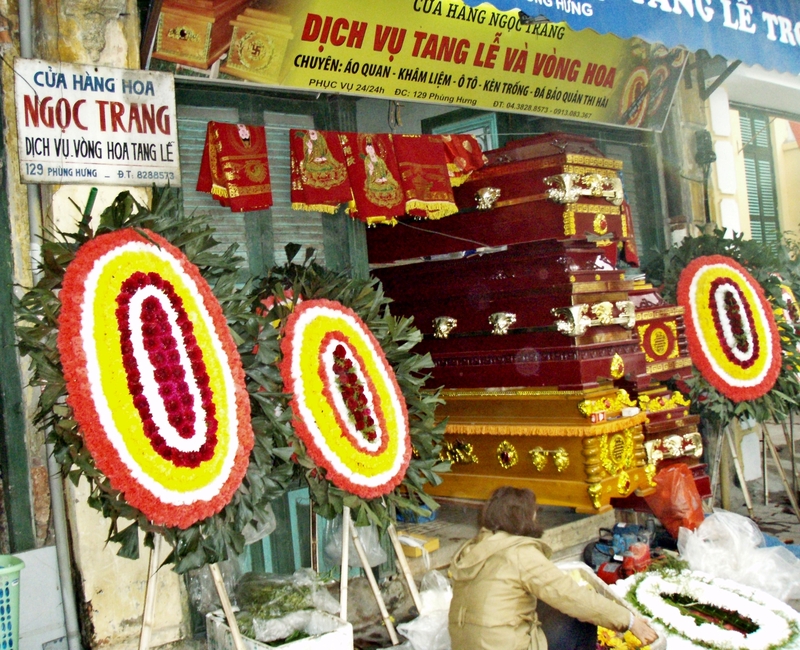 The district has many Hanoi tourist attractions and most of the largest Vietnamese public corporations and bank headquarters. 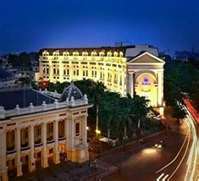 The Hoan Kiem District includes the Old Quarter, Hanoi Opera House, the National Museum of Vietnamese History, and the Thang Long Water Puppet Theatre which is absolutely on the list of things I must see. The central government offices are in Ba Dinh District surrounded at the north by Tây Hồ, to the east by Red River, to the south by Đống Đa, to the southeast by Hoàn Kiếm, and to the west by Cầu Giấy. I will investigate that area tomorrow and guess I should purchase a helmet if I continue to take motorcycles to get around. The streets in the Old Quarter are narrow and lend themselves nicely to motorcycle transportation. So far I haven’t seen any accidents but the swirl of machines around, over, and across each other is not for the squeamish. 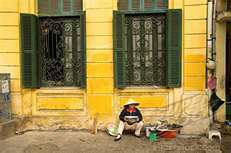 The Old Quarter is near Hoan Kiem Lake and has the original street layout and architecture of old Hanoi. “At the beginning of the 20th century the city consisted of only about 36 streets, most of which are now part of the Old Quarter. Each street had merchants and households specialized in a particular trade, such as silk traders, jewelry, etc. Today the street names still reflect these specializations, although few of them remain exclusively in their original commerce. 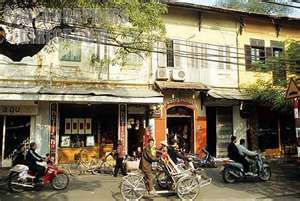 The area is famous for its small artisans and merchants, including many silk shops. Local cuisine specialties as well as several clubs and bars can be found here also. A night market (near Đồng Xuân market) in the heart of the district opens for business every Friday, Saturday, and Sunday evening with a variety of clothing, souvenirs, and food.” I’m looking forward to the night market this weekend! 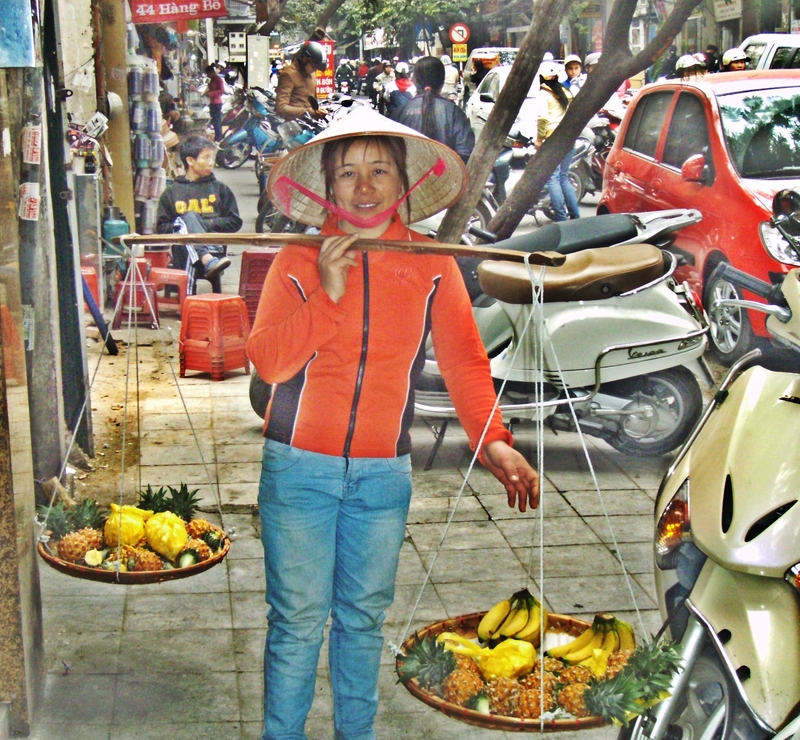 This entry was posted in Vietnam by suemtravels. Bookmark the permalink.